Advanced Fonts Viewer is a full-featured font viewer quickly generates a high-quality display of your fonts. With AFV you are able to: view all fonts; print font listings; install TrueType fonts; create selected fonts list; view fonts in various scales, styles, colors; display characters map; read font info; choose proper fonts list and test text. The browsing of all font characters on a full screen is convenient for evaluation of the quality and completeness of a font. If you use image fonts in your work, then being able to view any character on a full screen will certainly be to your liking. Advanced Fonts Viewer 5.15 is a shareware program and can be used as a demo to try the software until the free trial period has ended. A full version of the program is available after the trial period ends. 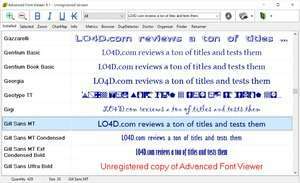 For security reasons, you should also check out the Advanced Fonts Viewer download at LO4D.com which includes virus and malware tests. Additional screenshots of this application download may be available, too. Provides a listing and frequent updates to the best Windows font software available from the web. Reviews and free download links are provided for convenience. Check out some of the freeware downloads available in the font pack category. They contain no strings and are available at zero cost.